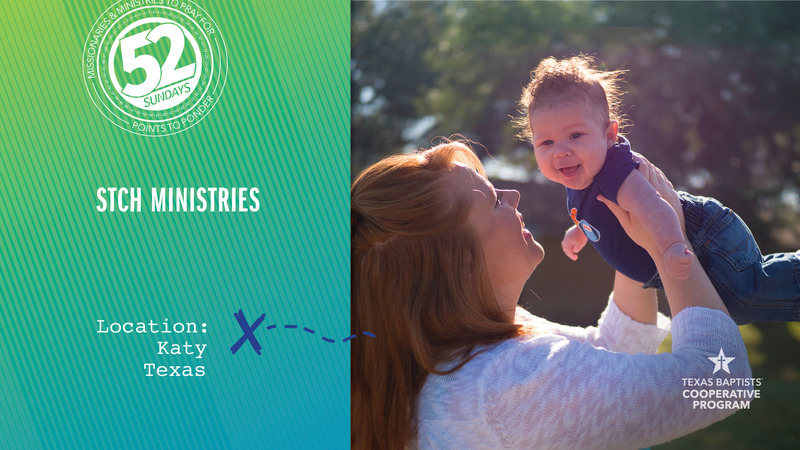 Homes for Families, a program of STCH Ministries, provides single mothers and their children an opportunity to heal and grow after abusive relationships, financial instability or homelessness. Leaving an abusive relationship, Ashley Kaufman visited Bear Creek Baptist Church in Katy. She was so upset that she ran out of the worship service and asked for help. She was told that STCH Ministries offered counseling services at Bear Creek, and was soon able to talk with a counselor. STCH Ministries welcomed Ashley to their Homes for Families campus where, four months later, her son, Isaiah, was born. This brought a new peace Ashley had never known. Our church’s gifts through the Cooperative Program help support life-giving work like STCH Ministries’ Homes for Families. Let’s pray together for God to continue to use STCH Ministries and our other ministry partners in this work.